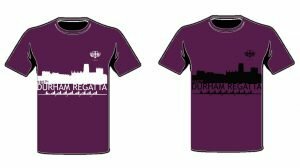 Submissions for the annual competition to design the Durham Regatta T-shirt have been considered by the committee and the entry from Hild Bede Boat Club has been declared this year’s winner. Each year sees keen competition for the right to design the prestigious T-shirt, and this year was no exception. T-Shirts are to be produced by Workwear Express and will be available in 6 colours – White, Light Blue, Royal Blue, Purple, Red and Forest, and in sizes ranging from XS to XXL. Shirts will be on sale from the gazebo in the regatta enclosure over the weekend of the Regatta.